In the late third century, wealthy Christians started commissioning the carving of marble sarcophagi for use in the catacombs, their network of underground burial chambers. More than decorative niceties, these relief carvings on the fronts were articulations of Christian theology—a visual expression of what these believers thought about death. Along with wall paintings in the catacombs, they served as confessions of faith and symbols of hope for the community after one of its own died. Funerals, it turns out, provided the context for the creation of the earliest Christian art. The fourth-century sarcophagus pictured above highlights three distinct scenes from Jesus’ Passion narrative—Christ before Pilate (in the two rightmost registers), the crowning of Christ, and Simon of Cyrene helping Jesus carry his cross. In the center we see a scene suggestive of the Resurrection. In all of these Jesus is depicted as calm, dignified, and untouched. The physical agony that came to characterize him in the art of the Middle Ages is absent. Young and beardless, he’s your typical Roman hero, and like a philosopher, he holds a scroll. Most notable, however, are the various emblems of imperial power, which here assign victory and supreme authority to Jesus. The laurel wreath, the eagle and the sun and moon, associated in contemporaneous Roman art with the emperor, are employed by the craftsmen of this sarcophagus in the service of Christian doctrine. All three come together in the central register, which is the focal point of the piece, the climax of the narrative and the main container of commentary. 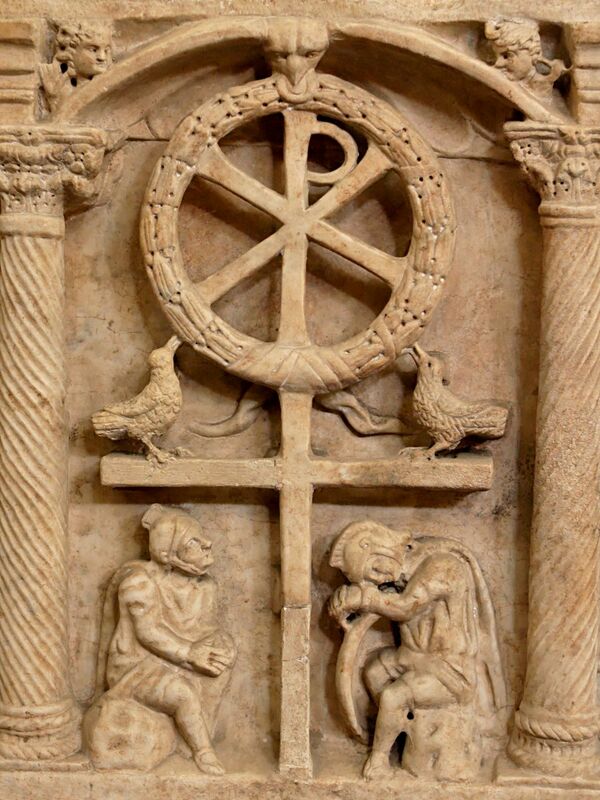 This register shows the chi-rho monogram mounted triumphantly on a cross and encircled by a laurel wreath, which two doves peck at from below. The chi-rho, or Christogram, is a symbol made up of the two Greek letters that form the beginning of the word Christos (Χριστος), “Anointed One.” The early Christians, while still a fringe group, devised this symbol as an expression of their identity as followers of Jesus. As was common in early Christian art, the chi-rho is enclosed in a laurel wreath, a token of victory and honor traditionally bestowed on successful military commanders and emperors. The wreath is presented by the eagle at the top of the register, an emblem of Jupiter, the giver of victory. This image is reminiscent of another similar one found on Roman coins of that era: an eagle flying down to the emperor with a scepter in its beak, signifying the divine sanction of the emperor’s rule. At the eagle’s wingtips Sol and Luna are present as divine embodiments of the sun and moon. These deities were common in portraits of emperors to emphasize the extent of the Roman rule and would later make their way into Crucifixion paintings. By reinterpreting the imperial iconography of their time, the makers of the Passion sarcophagus make a powerful theological statement: Jesus Christ has come to power, having acceded to the throne by way of a cross. The Father crowns him and the cosmos bears witness. The replacement of the biblical crown of thorns with the more culturally relevant laurel wreath infuses the otherwise bleak episodes of the Passion with the hope of resurrection. Christ is not shown here hanging on the cross. The early Christians were reluctant to depict him either dead or suffering. Instead, an empty cross hints at what was. Beneath it are two seated soldiers—one dozing off and the other looking up, perhaps pondering the event. This arrangement is evocative of the Resurrection, with the two guards outside the tomb. Intentionally so. By superimposing the cross over the empty tomb, the craftsmen show how the Crucifixion and the Resurrection are one unified event. The cross was not the end of the story. Christ conquered it; he emerged as Victor. This truth has huge implications for the faithful departed. If Christ’s tomb is empty, then so will ours be one day. Death does not have the final word. New life awaits. Sarcophagus with Scenes of the Passion (probably from the Catacomb of Domitilla), Rome, mid-fourth century. Marble, 23Êº x 80Êº. Museo Pio Christiano, Vatican, Rome.